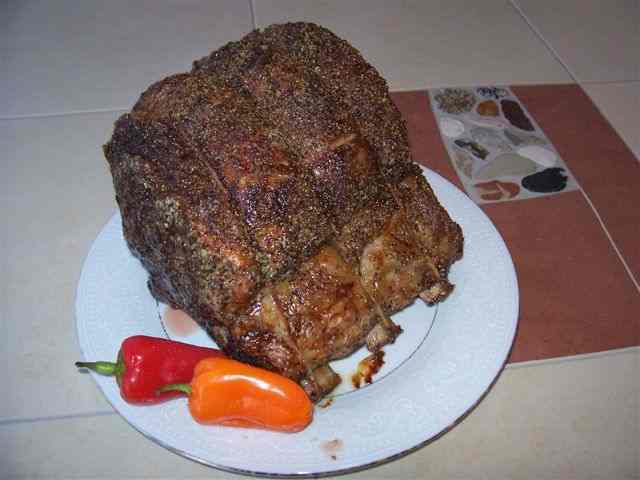 This recipe for Prime Rib is very flavorful. Prime Rib - At least three ribs for around 6 pounds total. The Roast should be at room temperature before beginning the cooking. If it is frozen, let it thaw completely in the refridgerator, and then let stand at room temperature for two hours. If refridgerated, let it stand at room temperature for two hours. Rub the ends of the roast with olive oil. Season the ends and the top (fatty side) of the roast with garlic powder, black pepper and ground sea salt. Rub the spices into the ends so that it will stay on as the roast cooks. Place the roast in a heavy metal pan with the rib side down. Place a meat thermometer in the roast so that the tip is in the thickest part and is not touching a bone. Place the roast in the oven for 15 minutes then reduce the oven temperature to 325 degrees (the temperature of the over will then gradually drop from 450 to 325). Do not open the oven during cooking. Cook for a total cooking time (including the first 15 minutes) of approximately 25 minutes per pound. The times are approximate and you should determine when the roast is done by its internal temperature of 135 degrees for rare, 140 degrees for medium rare, 150 degrees for medium, 155 degrees for medium well, and 160 degrees for well done. When at the desired temperature, turn off and open the oven. You should let the roast site for 20 minutes, durig which time the internal temperature will continue to rise another 5 to 10 degrees. (Ending itnternal temperature will likely be 140 for rate, 145 for medium rate, 160 for medium, 165 for medium well, and 170 for well done). To create "au jus" for dipping deglaze the dripping pan with a small amount of water, stir and pour into a small bowl. For horseradish sauce, mix a half cup sour cream with 1 ounce of prepared horseradish and 1/4 teaspoon salt.